These 20 diet tips may hold a few new ideas to help you stay on your diet, or you can use this list as a reminder of practices to help you reach your weight loss goals. 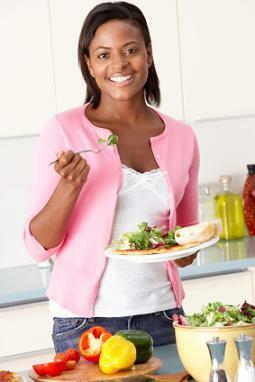 This list of 20 diet tips is centered on healthy diet practices. While the goal of dieters is usually to lose weight, it is important to remember that being thin should only be part of your goal. The other half is to be healthy. Our bodies are designed to thrive with proper nutrition and chasing after quick weight loss schemes is not the answer for losing weight and keeping it off in a healthy manner. Keep a food journal: Tracking what you eat is a great way to stay accountable. Some people find it best to plan out their calories for the day before their first bite. Others use the journal to trace eating patterns, time of day and other things that can help establish new eating habits. Eat breakfast: Eating breakfast gets you off to a good start and helps most people stick to their diet. Get regular exercise: Exercise is an important element for successful long-term weight loss. It not only helps you lose weight, but also aids in keeping the weight off. It doesn't have to be a complicated routine, but can be as simple as going out for a 30 minute walk three to five days a week. Strength training is important, too, as it helps maintain muscle mass. Be aware of your eating triggers: Dieting doesn't just involve what you eat, but why you eat. Learning what triggers unhealthy eating opens the way to changing that behavior. Join a weight loss support group: A weight loss support group lets you join together with like-minded people. The support generated by groups such as Weight Watchers can make the difference between success or failure. Learn portion control: One of the reasons obesity is rampant is that people don't understand portion sizes. Restaurants serve plates filled with three or four portions as one serving. Lose no more than one to two pounds a week: Slow, steady weight loss is best for health and long-term success. Chasing after quick weight loss schemes may offer quick results, but the weight usually comes back on just as fast and often with a few additional pounds. Limit refined sugar: Refined sugar offers empty calories and an easy way to gain weight. Limit your intake of refined sugars and replace them with healthy alternatives. Don't use food as a reward: Don't reward success with food. Instead, focus on other ways to pamper yourself like a bubble bath or pedicure. Establish new habits: Make small changes in your eating habits that can make a difference. It may be something as simple as cutting dessert portions in half or no snacking while watching TV or using the computer. Chew your food thoroughly: Take your time and chew your food. Eating slowly gives your brain time to catch up with your stomach and will help you not to overeat. Slow down and enjoy your food. Drink plenty of water: Drinking water is part of a healthy diet. Keep yourself hydrated and you'll have more energy. Eat less unhealthy fat: Cutting back on unhealthy sources of fat helps shed those unwanted pounds. Fat is calorie dense at 9 calories per gram compared to 4 calories per gram in protein and carbs. Don't skip meals. Skipping meals can affect blood sugar levels and leave you susceptible to overeating because you're so hungry. Know what you're adding to your food: Along with portions and choosing healthier fats, know what you're adding to your food. A baked potato may be low fat, but when you add three tablespoons of butter that adds 300 calories from fat. The same is true with many salad dressings. It's easy to sabotage your dieting efforts and not realize it. Take steps to avoid this mistake. Make a plan before eating out: Restaurants offer all kinds of yummy options. Before you head out for dinner make a plan. Look up the menu online and be aware of calorie content. Decide what you'll order before you step foot into the eating establishment. If you know they serve large portions, plan to ask for a take-away box when your food arrives. Put half your meal into the box before you start eating. Don't let one failure throw you into a tailspin: Don't expect perfection. Do your best to stick to your diet goals, and if you do "blow it" don't let that be an excuse to continue to eat whatever and however much you want. Instead, remember what you really want. A thinner, healthier you. Avoid late night snacks: It's best not to eat after dinner. Give your body a change to rest until breakfast. Get enough sleep: If you don't get enough sleep it can affect hormones that may help you gain weight. Leptin, which suppresses appetite, may increase while ghrelin, which can help keep you feeling satisfied, may decrease. See your doctor before you start your diet: With so much information out there about dieting, it is easy to grab one that sounds like it will work for you, but if you want to take a healthy approach it is best to see your doctor before you start a diet or fitness plan. As you put these 20 diet tips into practice, you'll see they are more than short-term guidelines. Following these tips will help you establish a healthy lifestyle. That's the real secret. It's more than a diet.